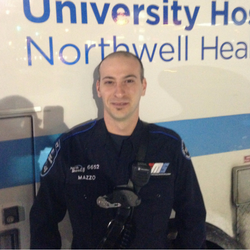 Robert Mazzo began his career as an EMT at the age of 18, in the state of Florida. Throughout his career in Florida, Robert received numerous accolades, specifically for his work during Hurricanes Frances and Jeanne. In March of 2013, Robert took his knowledge and dedication to the New York City 911 system, where he began working for Staten Island University Hospital Northwell Health. In 2016 Robert received the Staten Island Borough Presidents Award for EMT of the Year. Robert was nominated as a Star of Life by his peers. Robert was selected because of the leadership he brings to difficult situations, and for his commitment to showing kindness and respect to everyone he encounters.